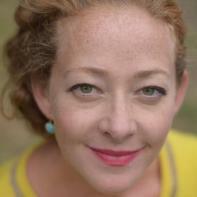 Ramona Ausubel is the author of the NO ONE IS HERE EXCEPT ALL OF US which won the PEN/USA Fiction Award, and the collection A GUIDE TO BEING BORN, one of the New York Times Notable Books of 2013. Her work has appeared in The New Yorker, the New York Times, One Story, Electric Literature and elsewhere. Her new novel is forthcoming in 2016. She lives in California with her family. This interview was conducted via email by Interview Editor Cass Murphy. Of the process she said, “I so enjoyed getting to discover the deeper layers of Ramona Ausubel’s already-piercing stories. Stories in which reality is optional offer such interesting opportunities to readers. Ramona’s answers reveal what goes into such compelling and arresting pages.” Below, Ramona Ausubel discusses the absurd, the relatable, and the human in her collection A Guide to Being Born. Superstition Review: A Guide to Being Born uses the life stages birth, gestation, conception, and love to sort its stories. How does this structure contribute to the emotional resonance of the collection? Why did you decide to organize A Guide to Being Born in this way? Ramona Ausubel: I had written the stories one to the next, not thinking of them as a book yet. Then when I looked back at my work I realized that I had a lot about birth and death. At first I was worried and felt like this revealed a shortcoming on my behalf, a limitation in range. I brought this concern to my amazing teacher Michelle Latiolais and she laughed and said, “Um, that’s called a theme. That’s what makes it a book.” Right! Once I relaxed into it, I worked to bring those threads out rather than hide them, and one of the ways I wanted to do that was to organize the collection in such a way that it felt like one big cycle. SR: Despite the categories, each section covers a wide array of themes. For example, the story “Poppyseed” in the Birth section features a child whose mind will always be that of an infant. This lack of growth struck me as a certain kind of death. What was your process for incorporating this duality into these stories? RA: Again, at first I was just following interest and ideas in each story. There was a story in the news about a girl with severe development disabilities similar to the girl in “Poppyseed” (I must stress how very, very fictional my story is) and it really caught my attention. The question of what love both gives us and costs us was really on my mind, as well as the many huge boundaries we cross over in our lives. Birth and death are two of those lines, but we cross many others as well. SR: Some of the stories in A Guide to Being Born have elements of magical realism: Hazel in “Atria” imagines that she will give birth to some sort of animal, while Ben in “Chest of Drawers” literally sprouts drawers from his chest. Could you describe how you would categorize the work? Who are some of your major influences? RA: I usually call these kinds of stories “fantastical” or “magical realism,” only because people often know what those words mean. In my mind, I just think of these as stories in which the physical world comes to reflect the outsized, far-reaching beauty or strangeness of the emotional world. When I began graduate school, I hadn’t read much fiction that did this kind of thing. I had a classmate, Marisa Matarazzo (everyone should read her collection DRENCHED—it’s amazing) who wrote these wild and incredible stories and, in a way, that was my permission to head that direction. I have since filled that gap in my reading with great astonishment and pleasure at all the glorious work in this amorphous category. SR: I loved “Chest of Drawers,” particularly the descriptions about the objects Ben assembles to put inside of them. How did you get the idea for this story? AS: Thank you! I love collections of things, so I had a really good time thinking about what he would put in those drawers. I don’t remember exactly how I thought of the conceit for that story. I was thinking about how it could be an odd experience for the partner of a pregnant woman to just go along as normal, and then I thought how odd it would be if he didn’t go along as normal. Somewhere in there drawers came to me! SR: "Welcome to Your Life and Congratulations” features a cat who gets struck by a car, and it takes several pages before his remains are finally, shall we say, 'taken care' of. The father's insensitivity is amazing in this story, from his cavalier attitude about finishing off the cat in the freezer to his attempt to bribe his son to cooperate with the possibility of future kittens. What was your process for creating such a character? RA: I love writing characters that are kind of terrible. I got a sense for that dad immediately and just let him be in charge of the day, following one bad idea to the next, and this poor kid trying to grow up in his difficult family and the mom a little oblivious. That story just happened and required very little revision. Not my usual experience! SR: The behavior of the academics gathered together for a lecture in “Magniloquence” was hilarious. This story struck me as more intentionally funny than others in A Guide to Being Born. Could you explain how you negotiated using (or not using) humor in these stories? RA: I went to a small liberal arts college so my first experience with the big pomp and circumstance of academia was at UC Irvine, where I went to graduate school. Every talk seemed to require three introductions—one person to introduce the dean who then introduced the introducer who introduced the speaker. It seemed absurd but I also found it kind of tender and adorable. The story was born from that combination. SR: How do the details of your stories relate to and influence the emotions that the characters are experiencing? RA: Details are my favorite, favorite part of writing. I always try to think of the world around the characters as being alive and part of the orchestra, there to serve the moments and emotions taking place. I try to allow the objects to hit the same notes that the characters are feeling (or to oppose them in an interesting way). I talk to my students about this a lot—writers are completely in charge of their inventories. We can put ANYTHING we want in there so we should put things that do work for the story, that mean something. RA: I love that site so much. It’s a really cool way of seeing a writer think about their work from a totally different angle. I linked some stories to songs by theme and others by feeling. This would be a good exercise for anyone working on a piece of writing—it could help name what’s most important about the piece. SR: How does reading influence your writing? What was the last book that you read, and what were some of your favorite books from the past year? RA: Reading is hugely influential to my writing but I couldn’t exactly tell you how. Some books give me a specific idea—what about such-and-such narration? Some give me a feeling that I need to investigate in new ways. Some offer permission into unexplored realms. Some I just love. The last book I read is a new collection coming out in May called I WAS A REVOLUTIONARY by Andrew Malan Milward. It’s stunning, stunning. It’s like all of American history is whirled up together in this gorgeous dust storm of terror and hope and cruelty. SR: How did your writing process change when your son was first born, and how has it changed as he has gotten older? RA: My son was three-months-old when my novel NO ONE IS HERE EXCEPT ALL OF US came out (it was also my first book) so I wasn’t writing new stuff but instead working on the launch. The work of having a book enter the world is very different than the work of writing a book and it suited that moment really nicely. I’d nurse the baby and answer emails or do interviews. Then the whole family went on book tour together, which was one of my favorite parts of my life so far—my two babies, making their debut. As he got older I got back to writing again. Now I have a new four-month-old baby, but this time I am working on the last big draft of a new novel. It’s an exercise in flexibility! I have to say that while children do not make a person have more time than they did before, my kids have sharpened my sense of time and my ability to use it. Two or three uninterrupted hours are so much more valuable to me and I am surprised by how much I can do if I turn the internet off. SR: What writing projects are you working on right now? RA: My new novel (title still TBD) will be out in 2016. It’s the story of a wealthy couple coming to terms with the idea of wealth and wanting in the 1970’s. That sounds serious, which it is, but there’s also a giant, an ill-fated sailing voyage to Bermuda and three parentless children trying to survive in a tipi in the backyard of their fancy Cambridge home. RA: I usually either sit on the bed while the baby sleeps next to me or I go to cafes. I’ve learned to be flexible both because my time to write is snatched between other things and also because I’ve never lived somewhere where we could afford things like offices. I also kind of like writing in bed because it tricks my brain into thinking that I’m not working.